And this is something that I wish Barker had characterized better because it’s so obviously a poor description of great narrative games. Incidentally, I’m not trying to criticize or argue with Ebert. The former would be piling on to an argument that’s long since over. As for the latter, I’m obviously too late. I just want to discuss that central point. Because Ebert’s claim does seem reasonable on the face of it. It’s hard to imagine a great film where control over direction, camera work, and even script is (sometimes) essentially handed over to the audience. It was clear to me from experience that this didn’t destroy the narrative intent of the game creators, and that something powerful was gained in return. But at the time Ebert’s remarks seemed so off the mark I don’t give that central point the nuanced response it deserved. Barker failed to make a crucial distinction between an art-form as a whole and individual instances of that art-form. Cinema could also be described as allowing the viewer to go through “any emotional journey available”, but an individual movie does not. Great narrative (or you could say “cinematic”) video games also don’t present the player with “any emotional journey available”. Telltale’s The Walking Dead is a tragedy. Like Ebert’s example of Romeo and Juliet, the structure of the story does not permit a (satisfying) happy ending. Telltale’s representation of The Walking Dead is more interactive than (most) stage presentations of Romeo and Juliet, but the interactivity of that representation of the story still doesn’t permit a happy ending. A central question of Telltale’s The Walking Dead is whether it is more important to protect a child’s physical safety or their ethical/emotional humanity, in situations where you can’t protect both (or maybe not even either). Barker failed to address Ebert’s point about directorial control head-on. Given that audience-members are (probably) not great directors, and they haven’t even looked over the script in advance, interactivity implies a loss of directorial control that is clearly a loss in terms of ease of conveying a specific artistic vision. The correct question is: What is gained in return? One answer is that cinematic games have the potential to engage in actual dialog with the audience. They can have different reactions to different player choices. And, importantly, this is generally a distinct, small set of reactions to a distinct set of constrained choices. Dichotomies (and false dichotomies) are a very important feature of human thought, and a key bit of artistic potential that cinematic games have that cinema does not is the ability to explore that feature through interactivity. 1. Collaborative character interpretation: The players interpretation of a character influences interactive character decisions, which in turn influence how the character is portrayed as the narrative continues. 2. Forced parallel between audience emotions and character emotions: Games can use interactivity to force a parallel between character emotion and player emotion through game mechanics. Well-crafted game mechanics can induce a whole range of emotions, including hope, disappointment, triumph, frustration, suspense, tedium, flow, surprise, and epiphany. That goes for non-narrative games as well, but in a narrative game you can use those mechanics simultaneously to scenes where the character is feeling the relevant emotion. It’s not simple, there are real costs to doing so. If you want to create the emotion of suspense or triumph, you probably need to back that up with a real possibility of failure, often with no better way to get back to the story than “back up a bit and try that again”. And sometimes the objectives are contradictory; it’s hard to produce a mechanic that makes the player feel the character’s feeling of frustration without thwarting the forward progress of the narrative, or making the player so frustrated that focus is drawn away from the narrative instead of into it. Still, there are tricks that can be employed to have mechanics work one way in the game-as-game and another way in the game-as-narrative. Often this involves concealing the true nature of a game mechanic, or setting up player expectations and then thwarting them. Telltale’s The Walking Dead does so with quicktime events, which generally are “press X to not die” sorts of affairs, but used in other situations to get player emotions to mirror character emotions as diverse as suspense (a character doesn’t know if rescue will arrive on time), false hope (a character thinks they can struggle onwards if they try hard enough, but they can’t), and blind rage (a character thinks a fight they are in is a life-and-death struggle even after their opponent is helpless). If you think that it’s somehow inartistic to layer over a (narratively) disconnected art-form in order to get the audience in a particularly receptive emotional frame of mind, note that cinema does the same thing with music. Of course, games can use that trick, too. 3. False interactivity: Games can get moments where they have their cake and eat it, too, when it comes to directorial control. If you do a good enough job with getting the audience in the right state of mind, you can create a situation where the player’s action is invisibly constrained, offering them a false choice that seems like a real choice, where the player is really getting inside the characters head when they realize that there is only one thing they can do in this situation. Probably the most powerful example of this I’ve encountered is this scene from Ico, which occurs just after the “second act” in the game’s story. The cutscene breaks back into interactive gameplay right in the middle, where the protagonist has been separated from his friend and must quickly decide whether to leap a widening chasm to join her or to leave her behind and flee for safety. It’s a false choice, there’s no significant narrative for players who choose the latter, or even those who hesitate too long, just a game over screen. But that usually doesn’t matter, everything in the narrative and the mechanics of the gameplay up to that point sets the player up to make the right choice for the narrative, without hesitation. Instead of being a loss of directorial control, it’s a powerful moment of congruence. The problem of impoverished public spaces has several sources, many self-reinforcing. If people drive everywhere, they don’t spend a lot of time in between-building public spaces, so there’s no incentive to improve those spaces, and thus no incentive not to drive everywhere. If culture values private space over public space, the resulting public spaces reinforce those values. If people have hard jobs and long commutes, they might not want to linger anywhere on their journey back to their family, so even the indoor public spaces put convenience and speed over the friendliness of the space itself. And after a long drive home to the kids (who have no access to any sort of public space on their own), one might prefer playing in the back yard to driving out to the park (if there is one). On the architectural side, building one nice building won’t rehabilitate an otherwise unpleasant space, so why bother. And based on the idea that the right thing to do in public places certainly isn’t “hang out”, architectural fashions have risen disproportionately promoting elements that are intimidating, disorienting, or disconcerting. Wikipedia’s discussion of the critical response highlights that architects rated the building far more highly than the general public. 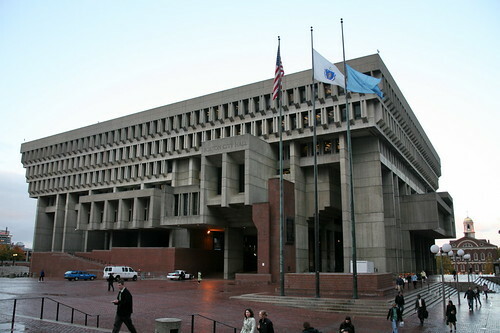 Seriously, did the architects actually think, “It would be great if Boston’s City Hall looked like an imposing concrete inverted UFO filled with bureaucrats, surrounded by a vast brick buffer zone where people have no reason to habitually linger, that’s what the face of local democracy and civic engagement in Boston should look like”? Presumably not. It’s just that it seems like a cool idea, any sort of cube-dwellers can be installed in any sort of building, the wide-open space makes for some dramatic light and shadow and consequently some pretty interesting photos if you crop them right.